Length and maximum diameter of a spherical roll are to be measured. For this, a system consisting of pairs of transducers facing each others is mounted on a ring, through which the object is pulled. For each transducer pair an identical limit value is predefined. A PLC controls the measurement process. 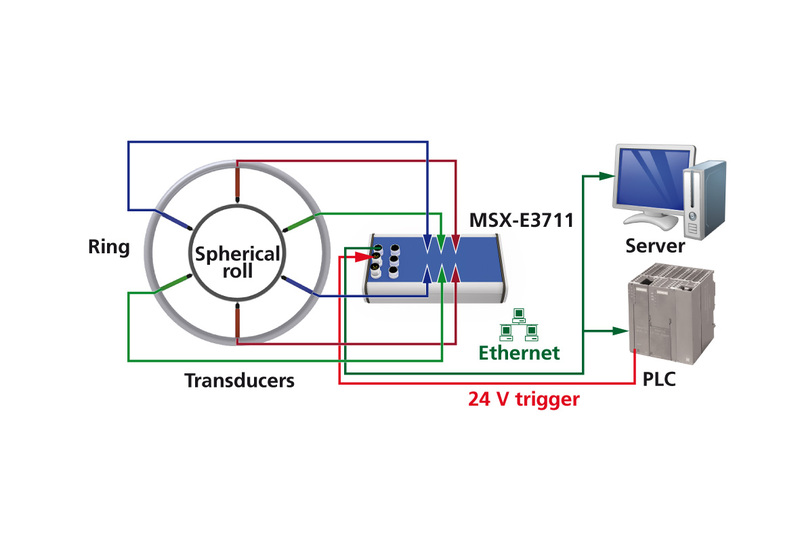 For this application, the robust Ethernet length measurement system MSX-E3711 has been chosen as it is suitable for the use close to the machine. The measurement values are acquired by 6 transducers that are grouped in pairs on a ring. For each pair of transducers, an identical limit value is predefined. Without measurement object inside the transducers are in the position of the maximum negative deflection. When both transducers of the pair exceed the value limit the “actual” data acquisition is started. If one of the transducers measures a value below the value limit or if a predefined number of measurement values is acquired, the measurement process is stopped. As measurement value, the maximum diameter (transducers 1 – transducer 2) is returned to the PLC: In addition, with the two measurement values, the value for the first transducer can be detected. With the motion speed of the measurement object through the ring, the measurement speed of the electronics and the number of the measurement, the position of the maximum diameter is related to a measurement object. The onboard calculation saves resources of the super-ordinate control unit.